The content on this webpage has been prepared by DPI Forest Science. DPI Forest Science provides research and development services to the forestry sector and a number of stakeholders including Local Land Services who are responsible for the management and authorisation of private native forestry operations in NSW. The North Coast region comprises 9.7 million hectares of land, with 65 per cent of it forested. Over half (3.4 million hectares) of the region’s forests are in private ownership, spread across thousands of individual holdings. 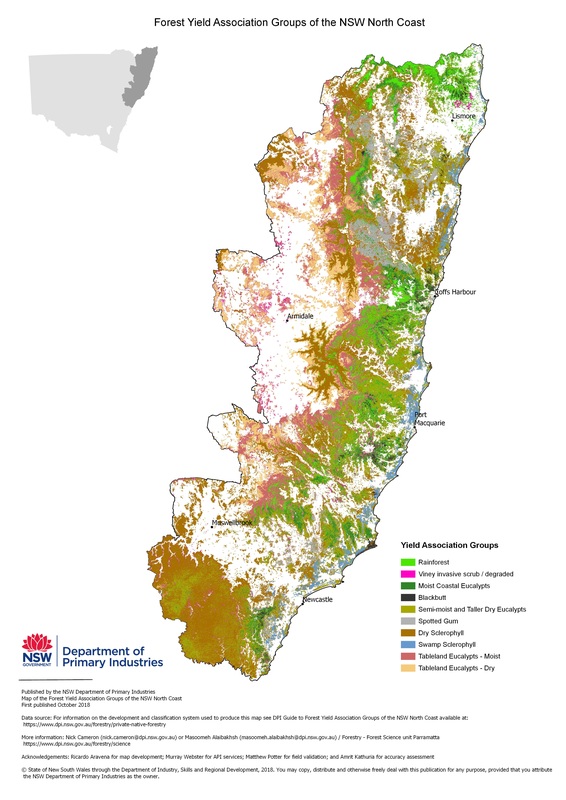 The NSW Department of Primary Industries (DPI) has recently completed a two-and-a-half-year study on the extent and status of private native forests (PNF) on the North Coast. The project saw more than 600 landholders, contractors and industry representatives interviewed or surveyed, as well as more than five million hectares mapped, and one million hectares of timber resources assessed using aerial photography. Research found a large number of properties could be more actively managed for sustainable timber operations and other values. Applying best practice silviculture has the potential to generate income, create new jobs and create forests that are healthier and more productive. This is the first time that information about the state and socio-economic significance of these forests has been quantified at such a scale. The NSW north coast has a diverse array of forest types ranging from lush rainforests to dry sclerophyll. For those with an interest in native forests understanding their distribution and extent of the different forest types is important. 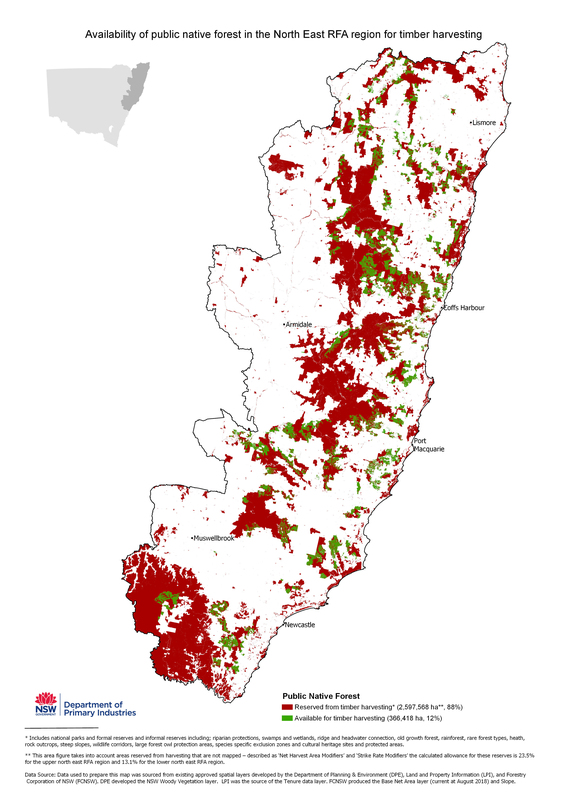 Existing maps of the vegetation types of the NSW north coast are mostly based on ecological associations which cater for environmental interests. DPI has produced a Forest Yield Association Map which has been designed for those with an interest in forest trees and forestry. The Forest Yield Association Map classifies 5.3 million ha of north coast native forest into ten broad forest types and covers both public and private land. A medium resolution A3 scale map and its accompanying map guide are available below. For a copy of the map in high resolution spatial format please email a request to: masoomeh.alaibakhsh@dpi.nsw.gov.au. 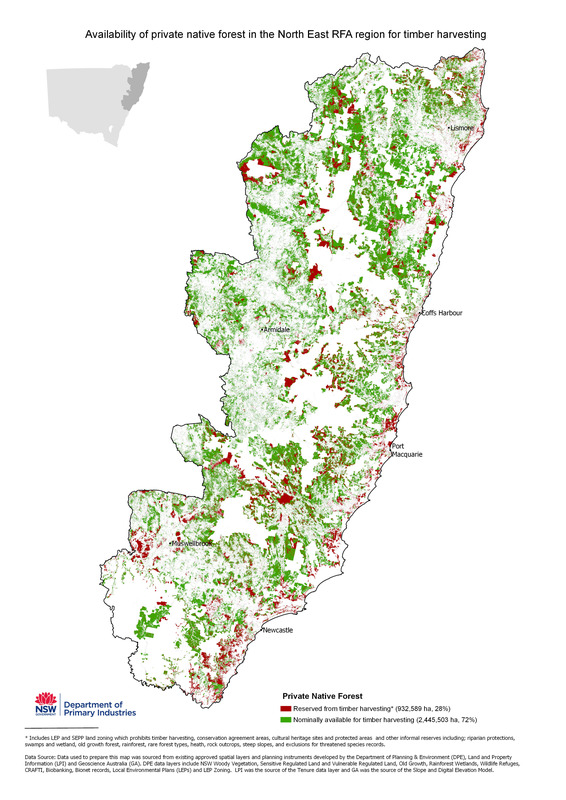 DPI has mapped (KMZ, 57753.99 KB) the coastal private native forests according to their growth status and productivity. To qualify, these forests had to be in stands greater than 25 hectares, of commercial quality and not subject to any known regulatory exclusions. Note: Maps have been simplified (reduced in size) to allow for viewing in Google Earth. This process has had some effect on map quality and resolution. To view the maps, you will need to download Google Earth on your device. A report on the silvicultural condition of the of private native forests between Coffs Harbour and the Queensland border found that the forests are predominantly mixed age with a high proportion of young trees that are less than 40cm in diameter. There is a lot of young regrowth forest out there however much of it is not in a good growing state. The report found, for example, that half of the basal area of measured trees in the 25-40cm diameter class had suppressed or subdominant (weak) crowns. The NSW Forestry Industry Roadmap commits to implement a modern regulatory framework for the NSW forestry industry that ensures the industry is ecologically sustainable. This includes a review of the regulatory arrangements applying to private native forestry. The below report examines the NSW planning and regulatory instruments that interact with private native forestry using the NSW North Coast region as a case study. It identifies key issues and illustrates the extent and complexity of the regulatory framework. It is intended that the information presented in this report will help to achieve regulatory modernisation. Read the report on NSW planning and regulatory instruments that interact with private native forestry (PDF, 3445.88 KB). DPI has mapped the private and public native forests on the north coast according to their availability for commercial timber harvesting. DPI found that the area legally available for timber harvesting on private land constitutes 72% of the region’s private forest estate. In contrast it found that timber harvesting is limited to 12% of the region’s forest that are in public ownership. In practice, not all forests legally available for timber harvesting are suitable for timber harvesting. On private land less than 10% of private native forests have an approved private native forestry (PNF) Plan. A survey of 515 landholders , that manage 25 hectares or more private native forest, found that their native forests are used for a large variety of purposes. The dominant land-uses include stock grazing, shade and shelter, on-property timber use and habitat for animals and plants. Use of private native forests is influenced by their locality and the duration a property has been in single ownership. The report provides further information on landholders’ attitudes, knowledge and intentions to gain income through private native forestry activities. Two surveys were undertaken in 2017 to quantify PNF production levels and socio-economic significance. Research found that PNF harvesting contractors play a central and major role in facilitating timber supply and are relied upon for advice by landowners who have limited knowledge of forestry. The timber yield from North Coast PNF operations is estimated at 275,000 m3 per year which represents 38 per cent of total North Coast hardwood log production. In comparison, the Forestry Corporation of NSW produces 450,000m3 of timber per year from North Coast state forests that are less than half the size of the private native forest estate. The production figures suggest that there may be scope to create more jobs and grow the regional economy on the back of PNF. These documents are not fully web accessible, please contact nick.cameron@dpi.nsw.gov.au for more information. This website contains reports and maps that were prepared by authors unrelated to the NSW Department of Primary Industries ("the department") for information purposes only. They do not express the views of the department and have not been verified by the department. The reports and maps should not be relied upon as professional advice. Readers are responsible for making their own assessment of the reports and maps. No representation, warranty or endorsement, express or implied, is made or given as to the accuracy, currency, reliability or completeness of the information, opinions or conclusions expressed in the reports and maps. To the maximum extent permitted by law, the department and the State of NSW and their employees and agents will have no liability (including but not limited to liability by reason of negligence) for any expenses, losses, damages or costs whether direct, indirect or consequential (including but not limited to loss of profits, loss of revenue or loss of business opportunity), which may be incurred as a result of the use of or any reliance upon the information contained in the reports or maps. This exclusion applies regardless of whether there was any error, omission or misrepresentation in the reports or maps.